Rupture is a framework for easily conducting BREACH and other compression-based attacks. This research is being conducted at the Cryptography & Security lab at the University of Athens and the National Technical University of Athens. or you can also install each module separately, as below. 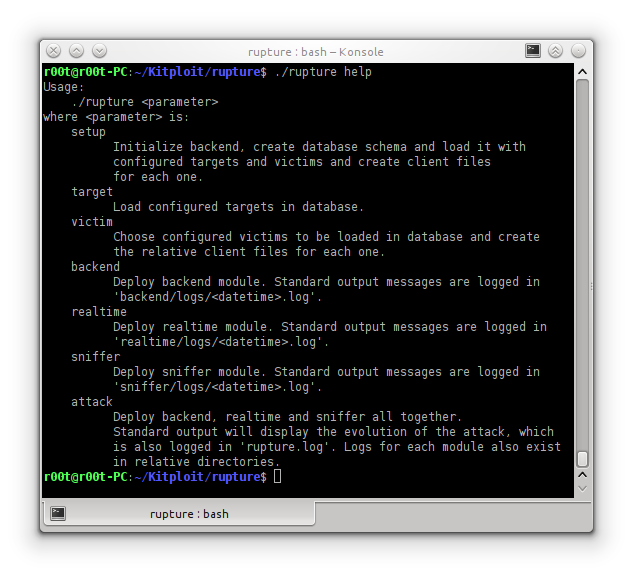 Rupture uses Python for the Command & Control server. Communication between js realtime server and Python backend is performed with a Django API endpoint. Note: Sniffer deployment - either standalone or all together with 'attack' - may need elevated privileges, since it requires access to network interface. where is the victim's id in the backend database.